Miu Miu’s bedazzled heels are the perfect statement shoes for festive parties, holiday bashes or New Year’s Eve celebrations. Whether heading to the city’s hottest clubs or to a formal holiday event, you’re sure to make a statement in these eye-catching shoes. The stilettos boast a jewel-encrusted design that adorns their suede materiality. 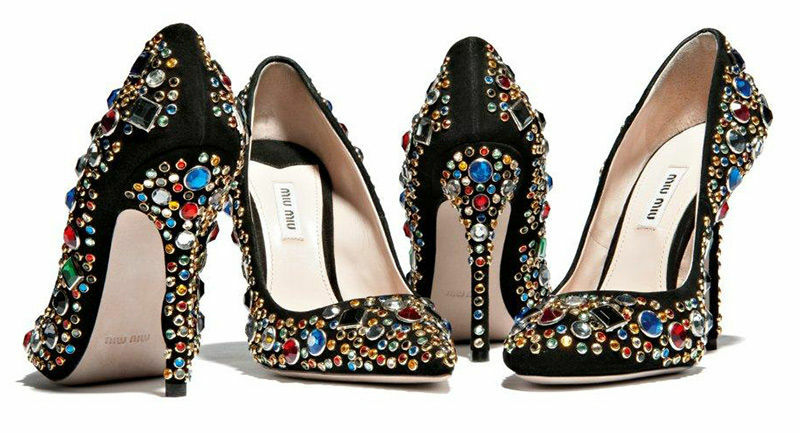 The statement shoes are adorned with colored rhinestones that are displayed in a sea of red, blue and emerald tones. These bedazzled heels by Miu Miu are reflective of the label’s luxe and youthful aesthetic. Unlike Prada’s prim accessories, sister label Miu Miu is all about fun, glitter and effortlessly cool fashions. Its pieces are carefree and can always be worn to a festive affair.